The EIT is responsible for the assessment of an individual Innovation Community's performance and those cross‐Innovation Community elements that contribute to accomplishing the EIT's mission. The EIT and Innovation Communities contribution to Horizon 2020 is monitored by the European Commission. Closely monitoring the Innovation Communities allows the EIT to promote cross‐fertilisation between its Innovation Communities. The EIT assesses the Innovation Communities based on a continuous monitoring system. By ensuring accountability and identifying opportunities to improve operations, the EIT's monitoring system incentivises high quality results, innovation excellence and an efficient use of resources. The EIT monitoring system evolves with the maturity and growth of the Innovation Communities' operations. This adaptive monitoring approach means that the EIT reviews its monitoring practices on a regular basis and adapts them to the evolving context in which both EIT and Innovation Communities operate. The adaptive nature of the EIT's monitoring system is essential as the number of Innovation Communities grows over time and they develop at different speeds. While there is a common underlying philosophy to the EIT's monitoring framework, its implementation is suited to the different Innovation Communities. This includes a tailor‐made approach per Innovation Community that takes into account the thematic area that it operates in; as each Innovation Community aims at overcoming a particular societal challenge, no two Innovation Communities are the same. The EIT's innovation review system consists of three components: strategy, implementation, and results and impact. The EIT Governing Board assesses the development and implementation of an Innovation Community's multiannual strategy as well as its contribution to the EIT's overall mission. The strategic assessment examines the integrated portfolio development and management and Knowledge Triangle integration. Conclusions from the assessment at strategy level provide insight into good practices and provide guidance for improving the Innovation Community model. Monitoring the EIT strategy is coupled with the systematic collection of information on result, impact and context indicators. The EIT has devised a comprehensive set of well‐defined indicators to monitor the implementation of Innovation Community Business Plans. 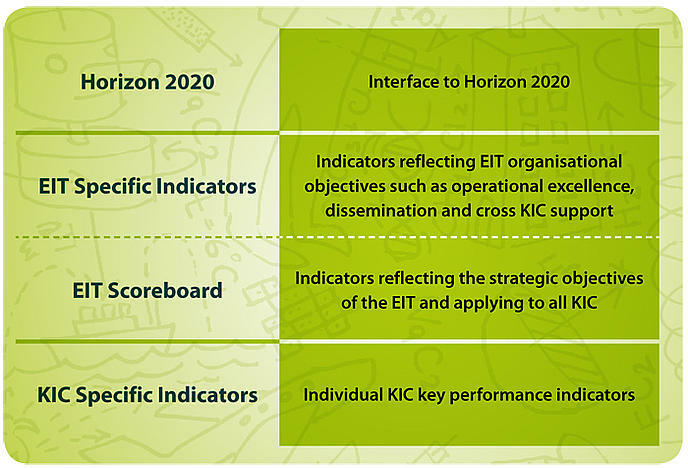 These indicators enable the EIT to measure and communicate its contribution to Horizon 2020 objectives, to control EIT internal processes and to track the performance and progress of the Innovation Communities in a standardised manner. The collection of indicators is complemented by on‐site visits by EIT staff to the Innovation Communities to verify actions and compliance and to obtain contextual information enabling a proper interpretation and assessment of the information. Surveys are organised to measure the degree of satisfaction of Innovation Communities stakeholders and effectiveness of the Innovation Community model (for instance, following the careers of graduates from EIT‐labelled educational programmes). Returns on EIT investment in the Innovation Communities are to be measured in terms of tangible benefits for the European economy and society at large, such as the creation of new businesses, products and services in existing and future markets, contributions to tackling societal challenges, better skilled entrepreneurial people, new and more attractive job opportunities and the attraction and retention of talent from across the Union and abroad. This requires the setting-up of a robust results‐oriented evaluation system for the EIT and its Innovation Communities, focusing on achievements, results and the generation of both economic and societal impact to be benchmarked against best international practices. To have a comprehensive view of the impact brought about by the EIT and the Innovation Communities, the EIT evaluation system combines evaluations carried out by the European Commission with assessments of topics of strategic relevance for the EIT performed by the EIT or the European Commission.